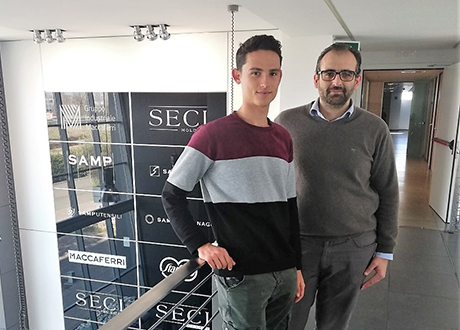 I started the 2019 in the best way for my educational and vocational training thanks to my internship experience in Sampsistemi. Thanks to the programme alternanza scuola-lavoro (which is an equivalent to the UK “Young apprenticeship programme”) supported by my school, the Istituto di Istruzione Superiore Aldini Valeriani, I had the great opportunity to join the Sampsistemi company as an intern. I found this experience very useful because it has been a real-life working experience and my first approach to a job related to my studies. I’m also sure this internship will help me decide whether to attend University. Since the very beginning, I enjoyed working in Sampsistemi not only for the tasks I had but also for the friendly environment I found. My tutor and my new colleagues warmly welcomed me to their group and allowed me to participate actively to many different work activities linked to my school education. Indeed, with my tutor support I learned how to use “Autodesk Inventor”– a computer-aided design application for 3D mechanical design, simulation, visualization, and documentation. Moreover, realizing 3D technical drawing has been the activity I liked most. I also started using a management software and understand how to plan the production activities. Thanks to my colleagues, with whom I have developed a close and friendly relationship, I have realized the importance of the teamwork and the need to carry out a job with commitment and precision. My Sampsistemi internship has been such an inspiring experience and this is the reason why I would like to work for this company in the future especially to contribute to its innovative solutions manufacturing. In conclusion, I can state with certainty this Sampsistemi training has been an intensely educational experience for me and I would sincerely recommend it to all my classmates and friends also because you have the unique chance to put in practice everything you have learned at school from a theoretical point of view!